Regardless of age, rank or MOS (military occupational specialty), Marines must keep themselves fit and ready to perform their mission. If you want to become a member of the United States Marine Corps, you will need to be able to master several fitness tests. 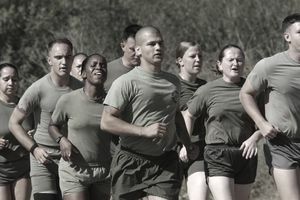 For instance, in order to join the Marine Corps, you will first take the Initial Strength Test (IST) as a recruit before boot camp which is a test consisting of pull-ups, crunches, and a 1.5 mile timed run. Every year, Marines have to take two physical fitness tests: the USMC PFT (pull-ups, crunches, three-mile run) and the Combat Fitness Test (CFT) which is broken down into three categories of testing: An 880 yard run in boots and pants, ammo can lifts, and a maneuver under fire. This job-related test is designed to simulate many of the tasks that a Marine in a combat zone should be able to perform. Along with USMC obstacle courses, the combat fitness test is considered a functional training and testing program. All Marines have to perform a predetermined number of pull-ups, push-ups, crunches, and a three-mile run. The specific numbers and times depend on the Marine's age. Like other branches of the U.S. military, the Marines factor not just weight but body fat percentage when assessing physical fitness. The numbers are based on height and age, and measurements of neck and waist circumference. 880-yard run: Run for 880 yards while wearing boots and camouflage uniform (pants and t-shirt). Ammo can lifts: Lift a 30-pound ammo can from the ground, over their heads as many times as they can in two minutes. Move in a quick scurry for 10 yards, then a high crawl for another 15 yards. Perform five push-ups, pick up the two 30-pound cans and sprint to the finish line. The Marines have made it more difficult to maximize the points throughout all the age groups. For instance, the number of reps needed to achieve max points in the ammo can lifts have doubled in the latest iteration of the test. Marines have to score over 100-120+ to get max points depending on age in the eight age groups.